In general we don’t accept dogs. However, very occasionally, under certain conditions, we may accept one. These conditions are a bit complex! This isn’t because I enjoy making byzantine rules. I love dogs and would happily welcome them as guests. However, though Chamonix is a great place for dogs, the chalet is not particularly suitable. The garden is not enclosed and there are plenty of dangers for dogs in the area – a fast flowing river, a railway, roads, and wild animal trails. The easiest thing is to email me with details and dates, and I will let you know if it’s possible. Dogs may be accepted for the last week of August and any time after that up to November. In winter we may accept dogs if there is a non-skier in the party, but not at the peak times of Christmas or New Year week, or the half term weeks. In winter, we only accept female dogs, and males if they are small enough to be carried. We make an extra charge which will be confirmed at time of booking. If you’d like to understand the issues – read on! The full rules and reasoning! • No puppies (under 1 year). • The dog must never be left alone in the chalet. • No dogs on the furniture. • Does it shed? And if so, how much? I will ask you to please be upfront about how much it sheds, so I can organise the cleaning as needed. I estimate a reasonable amount which is included in the dog charge. Please note this is to cover extra work incurred in checking everything and picking occasional stray hairs – extra cleaning due to dog hair being everywhere will be charged for. If your dog is a heavy shedder please tell me! If the levels of hair are excessive we may find it necessary to do an extra clean, which we would take out of your deposit. This is because the chalet inevitably needs a bit more cleaning after a dog has stayed. And it adds a level of unpredictability. It is very difficult to get extra help at short notice on peak changeover days, and I feel it is not fair on incoming guests. 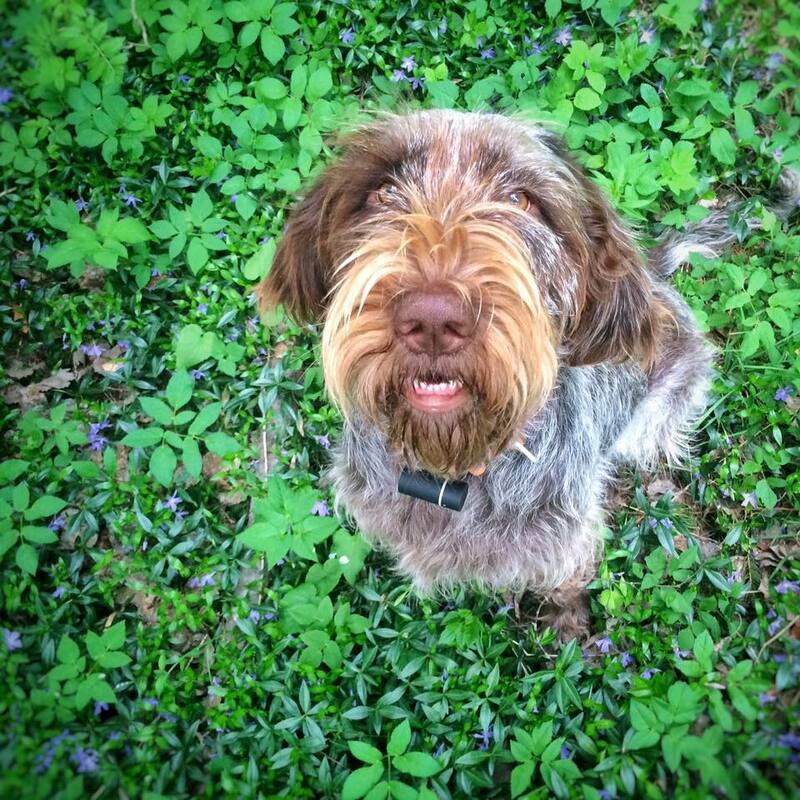 We have a dog – Daphne the Italian Spinone. She’s very friendly and enjoys dog guests! They will inevitably encounter each other so we do ask that you only bring your dog if it is reliably good with other dogs and not prone to excessive barking. • We accept dogs in last week of August and any time after that up to November. As the garden has large areas of meadow and woods, it is impossible to completely prevent dog mess. It is not like a big open lawn, where it can be easily seen. As or guests in July and August are primarily families, who enjoy playing in these long meadow areas and woods, we only allow dogs if there are unlikely to be small children staying in the following weeks. • No large male dogs are allowed in winter. I am afraid it is absolutely impossible to prevent them marking the snow. We have tried this and failed. It just cannot be done. It is a very difficult job to remove the staining and unfair to subsequent guests, especially families. Smaller dogs can be carried out of the immediate area so these are OK.
• Dogs must not be allowed to run around in the garden in winter. They must be on the lead at all times when near the chalet. This is not as bad as it sounds, and we stick to this ourselves. We are in the middle of lovely woods, and you only have to walk out of the driveway to begin miles of wonderful dog walks where they can run and play. But since we have families staying, we cannot have dog mess of any kind in the snow of the garden, where children play. It’s very off-putting for a family to arrive to a garden that’s clearly been used by dogs. If the dog runs in the garden (and the tracks make it very clear!) I have to go over all the tracked area checking for pee and poop, which is a long process. It only takes a few seconds for a dog to pee, but it takes a good half hour to dig out of snow, it spreads unbelievably. This time will be charged for from the deposit. In winter, it’s normal for avalanche blasting to happen most mornings and sometimes throughout the day and evening. This can be traumatic for a dog that isn’t used to it. If your dog is scared by fireworks or gunshots, they will find it very frightening and should not visit in winter. Though the place isn’t really suitable, I would like to accommodate dog owners wherever possible, as I always appreciate finding dog-friendly accomodation myself. Thank you for your understanding. Chamonix is very dog-friendly and you can take them pretty much anywhere except food shops. 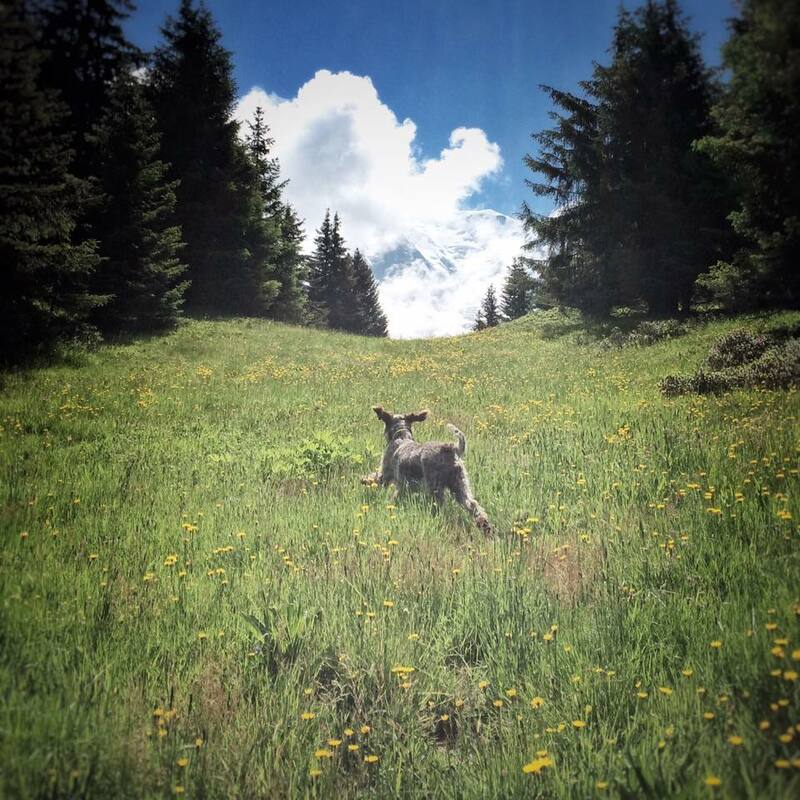 Read my blog post about Chamonix for dogs in summer here.